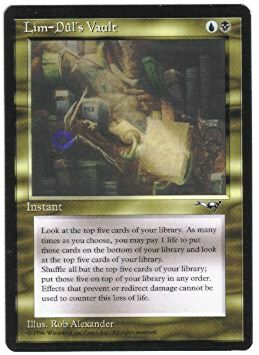 card text: Look at the top five cards of your library. As many times as you choose, you may pay 1 life to put those cards on the bottom of you library and look at the top five cards of your library. Shuffle all but the top five cards of your library; put those five on top of your library in any order. Effects that prevent or redirect damage cannot be used to counter this loss of life. This is a great card in my perspective. It's use is so under ..